I celebrated my Name Day last week by going to a short barista course. It was a hands-on workshop on how to use an espresso machine. We learnt how to grind coffee correctly, how to tamp it, which was surprisingly difficult, and how to brew it. I was okay at making coffee but excelled at frothing the milk! Something about controlling that steaming hot pipe and watching the milk heat and foam appealed to me. My frothed milk was so good the teacher used it to do some latte art. Sadly my attempt at doing bamboo latte art didn’t work so well. The class have asked her to run a workshop on that. Hopefully she will. A few weeks before the course I checked out a local coffee shop with spectacular results. 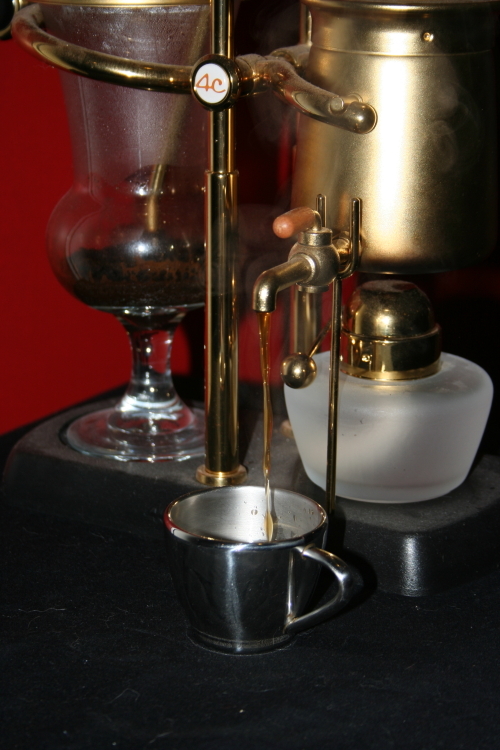 The biblically named Corinthians is a typical coffee lovers’ place featuring the usual coffee paraphernalia – syphons, drip filters, pour overs and my favourite – a cold dripper. This is the one piece of coffee paraphernalia I don’t have and want. Oh wait – I also want a home coffee roaster, and a proper espresso maker and … And that’s the problem with coffee! It’s not just the coffee that’s addictive but everything that goes with it! Managing to tear my eyes away from the cold dripper I scanned the chalkboard menu for the brews on offer. 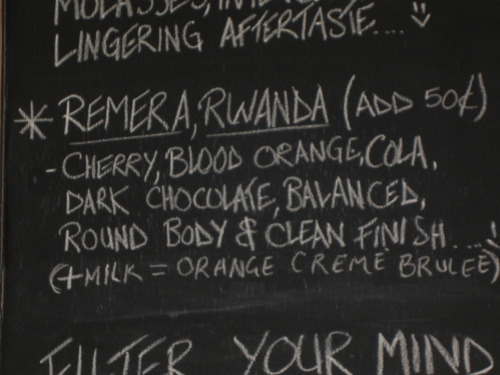 When I asked which coffee would be best for a flat white they suggested one from Rwanda. It was the best coffee ever!! For once I could taste all the flavours on the tasting notes – especially the blood orange. They asked my thoughts and I said it tasted like an orange creme brulee. Imagine my surprise and delight when I saw the waitress climb on a ladder and make an adjustment to the chalkboard menu. Under the tasting notes for my coffee she wrote – (+milk= orange creme brulee). Naturally I have been back for many more coffees!! my tasting notes immortalised for .. well until the next brew arrives! Toast the sourdough bread and lightly butter. 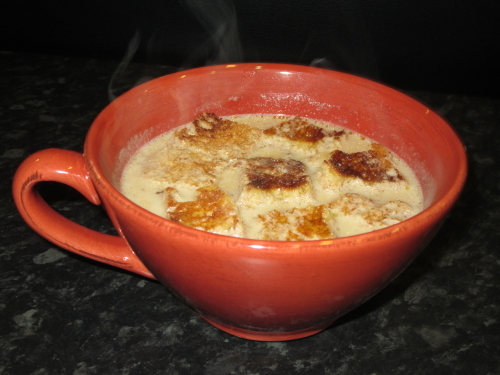 Cut remaining bread into cubes and place in the bottom of a soup mug. Heat milk in a saucepan with the sugar and cinnamon until almost boiling. Pour the freshly brewed coffee into the milk and stir through. Replace sourdough with different types of bread. Try soy milk for a nutty difference. Place the coffee and boiling water in a heatproof bowl. Stir until the coffee has dissolved. Add the salt and pepper. Allow to cool. Lay the cutlets flat on a board and cover loosely with plastic wrap. Gently tenderise with a mallet. Place the lamb in a glass or ceramic dish. Pour over the cooled coffee mix. Cover and refrigerate overnight. Mix flour and salt on a plate. Whisk the egg in a small bowl. 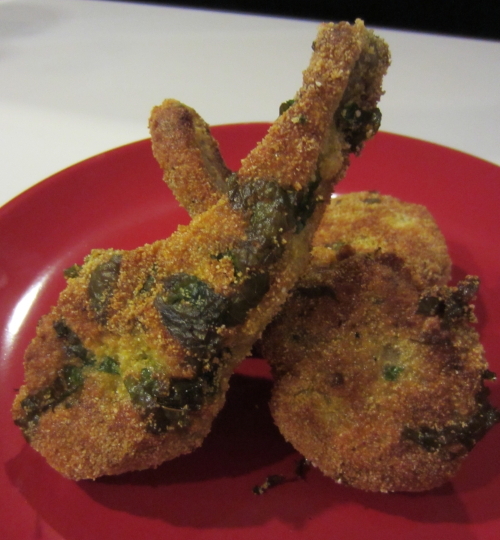 Combine the cornmeal and mint on another plate. Remove lamb from the marinade and wipe off most of the marinade. Working with one cutlet at a time, coat cutlet in flour, shaking off excess. Dip in the beaten egg. Dip in the cornmeal mix, pressing firmly to coat. Repeat with remaining cutlets. Pour enough oil to cover the base of a large frying pan. Heat over medium heat. Working in batches, cook the cutlets for 3-5 minutes each side or until they are golden brown and cooked to your liking. Drain on paper towels before serving. Let me know if you have found new ways to use coffee in your cooking or if you know of interesting coffee paraphernalia I can add to my list of wants. ← April Fool’s Day – What’s In A Name? Glad you liked the cutlets!